Found 11 file extension associations related to Keynote for Mac and 6 file formats developed specifically for use with Keynote for Mac. Keynote is presentation software, distributed as a part of Apple's iWork productivity suite, available for macOS, iOS and on-line. Easy-to-use tools let you add elements such as tables, charts, media, and shapes to your slides. Add a table with a click. Just as easily add a 3D chart that you can animate. With the Media Browser, you can drag and drop photos from your iPhoto or Aperture libraries, movies from your Movies folder, and music from your iTunes library. 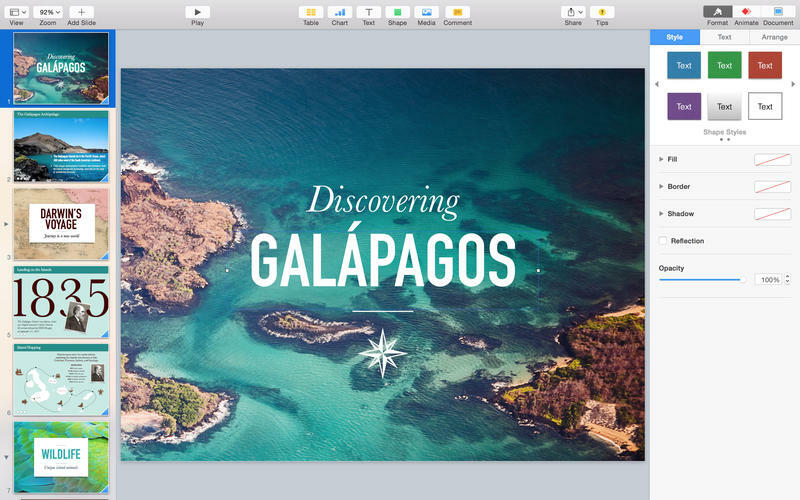 Make each slide in your presentation look its absolute best, using the powerful graphics tools built into Keynote. Quickly and cleanly remove the background of an image using the Instant Alpha tool. Or mask it within a predrawn shape, such as a circle or a star. With alignment and spacing guides, you can easily find the center of the slide and see if objects are spaced evenly. So anything you add to your slides — graphics, images, text boxes, or shapes — is placed precisely where you want it. If you’re adding a flowchart or a diagram to your slide, then you’ll appreciate the new connection lines feature. Connection lines between two objects remain anchored, no matter what changes you make. Move the objects around, and the lines move with them. With your choice of more than 25 transitions, including 3D transitions, you’re sure to keep their eyes riveted to the screen as you move from one slide to the next. Apply the new Magic Move transition and a repeated object, such as your company’s logo, automatically changes location, scale, opacity, and rotation across consecutive slides. Text and object animations are a compelling way to punctuate your message. Morph text on one slide into text on the next slide. Build your slide one bullet point, table row, or chart series at a time. Or have it all appear at once, entering stage left or spinning onto the screen. You can fine-tune your animations by setting the duration, choosing which element is affected first, and defining the animation path along a straight line or a curve. Keep the pace of your presentation flowing smoothly with the Presenter Display feature. While your presentation appears on the main display for your audience, you can see the current and next slides, your slide notes, a clock, and a timer on a second display. Add Keynote Remote to your iPhone or iPod touch and feel free to roam around the room while you present. Using Wi-Fi, Keynote Remote turns your iPhone or iPod touch into a wireless controller. In landscape view, see the current and next slides. In portrait, see the current slide with your slide notes. Tap to play and swipe to advance, wherever you are in the room. Keynote gives you a variety of ways to bring your show to the people. You can use it to import presentations created in Microsoft PowerPoint and to create presentations that can easily be saved as PowerPoint files. You can also export your presentation as a QuickTime movie, or a PDF, HTML, or image file; or even directly to YouTube. Keynote does the format conversion for you. Open and convert Keynote presentations online - Using iWork for iCloud for making new and conversion of old Apple documents. If you need more information please contact the developers of Keynote for Mac (Apple, Inc.), or check out their product website.